Are All Those Summer Steaks and Burgers Giving You Heart Disease? 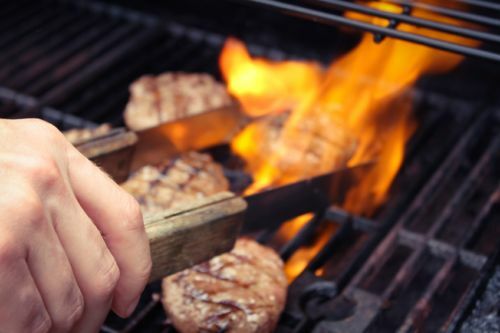 Home » General Health » Are All Those Summer Steaks and Burgers Giving You Heart Disease? You know those summer weekends away when the only food groups seem to be steaks, burgers, sausages, and veggies and dip? I know I do, I just lived through one. If you’re concerned about heart disease, those weekends seem pretty scary—and they can be, depending on how you do it. Burgers, steaks, and sausages are typically high in saturated fat and cholesterol, which have been associated with high blood pressure, heart attack risk, and heart disease for as long as I can remember. But guess what? That’s largely a myth. It turns out that the saturated fat and cholesterol found in red meat is actually neutral, which means that once it’s eaten, it doesn’t really have any effects; it just kind of floats around without impeding blood flow or collecting on your arterial walls. Now that might contradict everything you’ve ever heard about red meat, but I’m telling you it’s the God’s honest truth. The cholesterol that contributes to blockages and high blood pressure actually comes from refined carbs and trans fats—both absent in most red meat—so it’s actually the buns and sugary sauces you should be worried about. If you want to eat red meat a couple of times per week you’re probably not doing any harm. But don’t rejoice just yet; not every red meat is safe. If you’ve purchased processed meats—like most sausages, hot dogs, or frozen burgers—you’re still eating things that can put your heart at risk. Processed meats typically feature nitrates and high amounts of sodium that can contribute to heart disease, high blood pressure, and heart attacks. But burgers you make yourself from ground beef, turkey, or virtually every cut of beef or other game meat isn’t a major threat. Just be sure to fill the rest of your plate with some fresh vegetables and try to go easy on the buns and sugary sauces. Instead, cook with spices and other seasonings that are low in sugar, and opt for whole-grain buns if you can. Fun weekends away don’t have to sabotage your diet or put your health at risk. Eat smart; know where the risks lie and make informed choices to keep a healthy diet regardless of where you are or what you’re doing. Richards, V., “Cholesterol U-Turn as research shows fatty foods might not be bad for us after all,” The Independent web site, May 27, 2015; http://www.independent.co.uk/life-style/health-and-families/health-news/cholesterol-u-turn-as-research-shows-fatty-foods-might-not-be-bad-for-us-after-all-10277837.html, last accessed July 11, 2016. Office of Disease Prevention and Health Promotion, “Advisory Report: 2015-2020 Dietary Guidelines for Americans,” Health.gov web site, 2016; http://health.gov/dietaryguidelines/2015-scientific-report/, last accessed July 11, 2016.